Vertical Modern Address Plaque - - personalized home address sign holds up to four (4) large 4" numbers. Made in USA. 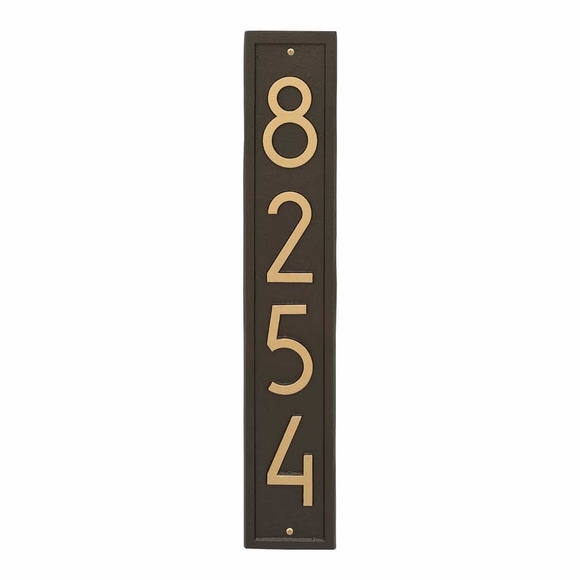 With a clean contemporary font, trending color options, and impressive 23.25" length, the Vertical Modern house number sign meets 911 codes and is big on curb appeal. Easy to read from the street. Cast from recycled aluminum and will not rust. Holds up to four (4) 4" numbers. Protected from weather elements with Alumi-Shield™ All Weather Coatings are suitable for all exterior locations. Seven color options: aged bronze, black with silver, coastal clay, coastal green, oil rubbed bronze, pewter with silver, and white with black. Large image color is aged bronze. Smaller images (from left to right) are black/silver, coastal clay, coastal green, oil rubbed bronze, pewter/silver, white/black. Dimensions: 23.25" x 4.25" x 0.325"; weighs 2.4 pounds. Proudly handcrafted in the USA using American materials and labor. The combination of a contemporary font and dimensional border give this plaque its modern look.